You may have noticed my "reviews" are not really critical. Lots of books are read that didn't quite catch my fancy or even in some cases left a poor impression. The idea is to only blog about books or movies that at least some of you might enjoy or find something worthwhile. 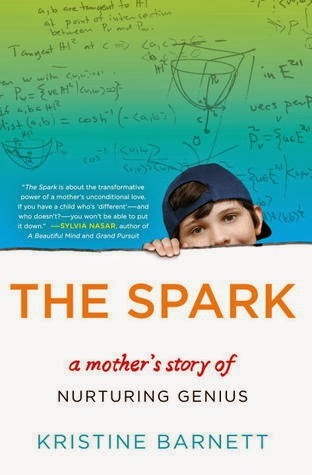 "The Spark" is a true story that may be unique, but should be inspiring to all us. We take a lot for granted. Autism is a term I have only a distant relationship to, but am aware that it is a big concern. My understanding of autism boils down to a communication and social breakdown. Autistic people don't relate to the rest of us in a way we are comfortable with (to our mutual disadvantage). Although by definition they have much in common, they also are individuals. This book is just as much about the author, Kristine Barnett as about her now famous son, Jake. Her background is unique and contributed to her understanding. She comes from an Amish family (modern) and an inventive Grandfather, a very understanding mother and a talented sister that all play a role. She met her husband, Michael under very unusual circumstances manipulated by her sister. Michael's background was from a rougher part of Chicago and they married very soon after first meeting. Another contributing factor in Kristine"e background was the fact that she ran a daycare centre. She was exposed to a wide variety of youngsters and helped develop her sensitivity to individuals. Jake, her first child was born after a difficult pregnancy, but for the first year or so seemed pretty normal, but then started to regress to the point he was diagnosed as autistic. Kristine was told that he would likely never read or even be able to tie his shoelaces. He was put into some programs to deal with his disabilities. A while later Kristine rebelled against the therapy that was totally dealing with disabilities and not responding to what interested her child. She pulled Jake out of the program without the support of her husband. Kristine really at this point was looking for something to set a "spark" that would let her reclaim her son. Eventually she did discover a spark that revealed Jake has a super memory and high level thinking. One incident was how he arranged coloured crayons in the spectral sequence that we know from the rainbow. As time went on his abilities and even more his drive to learn was given opportunities to express itself. At age three Kristine took Jake to an astronomy lecture and at one point Jake asked a question (using more words than his mother had heard him speak before) and then with the answer was able to provide an answer to an even earlier question that no one else was able to provide. He is now well known for being in the super genius class and we can now get better insight into the autistic mind. In his case while being non communicative he was absorbing information and trying to make sense of it. Kristine was really motivated by wanting Jake to be able to relate to other people. Back when he was about three she tried to prepare Jake for kindergarten. A key thing was for him to sit still long enough and not to disrupt the class. With every youngster there is some interest that needs to have an outlet and we all are happy and willing to co-operate. As the story unfolds, Kristine has two other children. Her second childbirth was also very difficult and Wes has severe health concerns threatening death. She and her husband stretched themselves and Wes overcame his difficulties. A bit later a third child, Ethan was born and was normal. The three children became supportive of one another. Kristine was concerned that other autistic children were being shunted to the side. She knew they were not all hidden geniuses, but they all had something that just needed a spark. She offered evening get to-gethers (partly to allow regular daytime therapies). She did not charge for this service, but found that parents were so grateful they wanted to contribute in different ways. She eventually built a sports centre for autistic children to help develop their social skills. All this activity kept her and Mike busy and she learned she had some serious health issues herselt. Lupus was underlying other problems, one of which was a stroke. In 2008, the financial breakdown hurt them and their Indiana community. Her husband lost a job and was awhile getting back on his feet. Their neighbors and daycare customers were also stressed. They got through all this stress with Jake and his brothers prospering. What I got out of the book, was not just an interesting story about an autistic child becoming a child prodigy, but that there is hidden potential in many people (in a sense everyone). Kristine tried to emphasize what a youngster was interested in, rather than their limitations and the burden of accommodating them. In Jake's case his contributions have already been significant and promise to be game changers. When I say that I am not just referring to scientific breakthroughs, but also his efforts to help others overcome "math phobia." Other contributions from people we currently ignore may not be as spectacular, but will enrich human knowledge and just as important human relations.